I have been following LWP@H since Debs first started blogging and I am so proud of all that she has accomplished in this time. 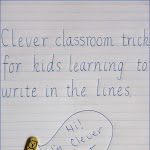 I just love how her activities are easily prepared and are quick to apply in the home setting. It is such a pleasure to be here today on LWP@H guest posting. I am Amie from Triple T Mum (tttmum). I am a busy mum of four kids, ranging from a teen, to a preschooler and toddler twins. This equates to 3 children under the age of 4. Life at times can be intense, it can be full on, it can be crazy! 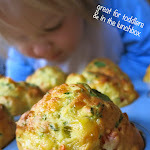 I love to share our family life, activities with the kids and ideas for making the mayhem seem less overwhelming. I also love to craft and whenever that 'spare' bit of time pops up, you'll find me creating something for the loves of my life. My teen, Gamer, recently put on a live music show for us all in the back yard, which inspired the littlest ones to make music. Not one to miss a crafting opportunity I put together a Castanet Craft Kit for the kids to create our own musical instrument. 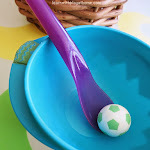 This is a quick and easy craft that uses easily sourced materials. 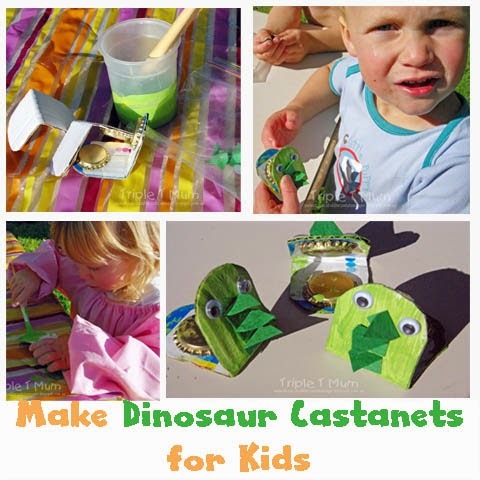 Kids will develop their fine motor skills during the making of the castanet as well as when playing their instrument. 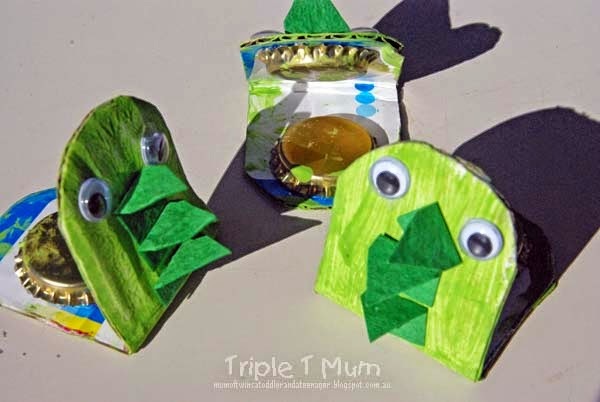 Materials: Each Castanet Craft Kit contains thick cardboard (I recycled the flaps off a nappy box), two bottle tops, craft paper cut into triangles and goggly eyes. You will also need scissors, hot glue, paint and double-sided tape. Cut the cardboard into strips. I just considered the size of my child's hand and cut to suit. Fold the pieces in half and round off the open edges with scissors. Hot glue the bottle tops to the cardboard, trying to get them even on both sides. 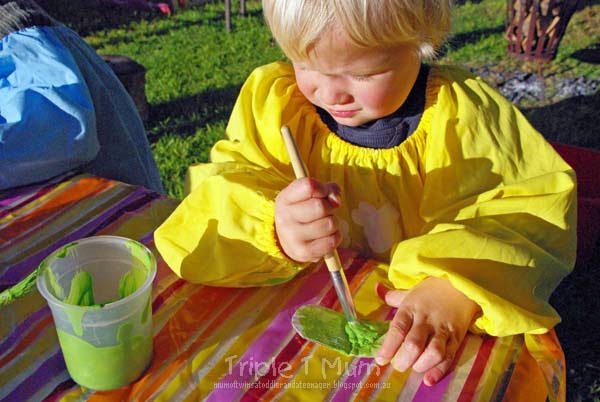 Kids can decorate them with markers, glitter, paint, let their imaginations go wild! We chose to paint ours and turn them into Dinosaurs! When the paint was dry I applied double sided tape where the eyes were to be placed and the triangles for the spines. Now for some fine motor skills! 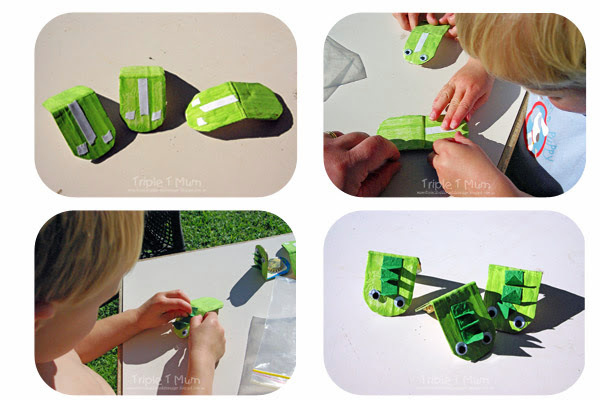 Kids attach the googly eyes and folded triangles to create dinosaur spines. I am an early years educator currently on maternity leave raising 3 young toddlers and a teen. 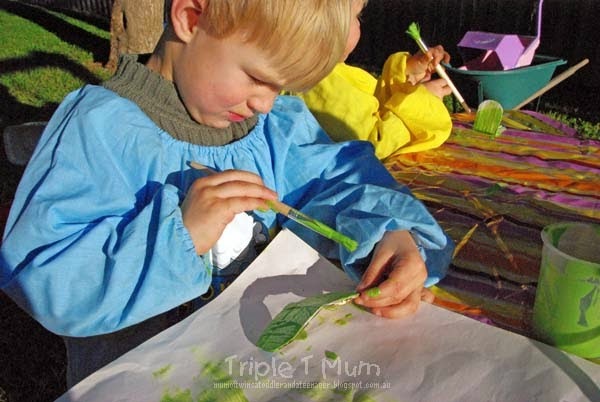 Triple T Mum is my space to share a bit of everyday life, an encouragement for me that in all this 'busyness' there are moments to savour. 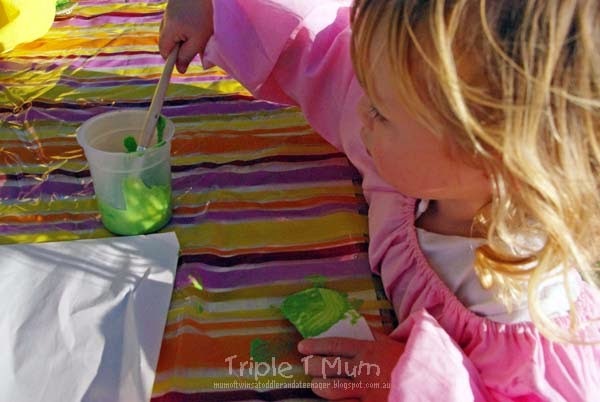 I love sharing activities I do with the kids and I love to create handmade crafts in my 'spare' time. I am inspired by the Waldorf philosophy in my parenting and I am working towards incorporating the Steiner educational philosophy in homeschooling mypreschooler. 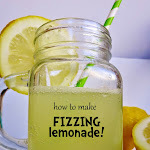 You can find Amie on her blog Triple T Mum and on G+, Facebook, Pinterest and Instagram. 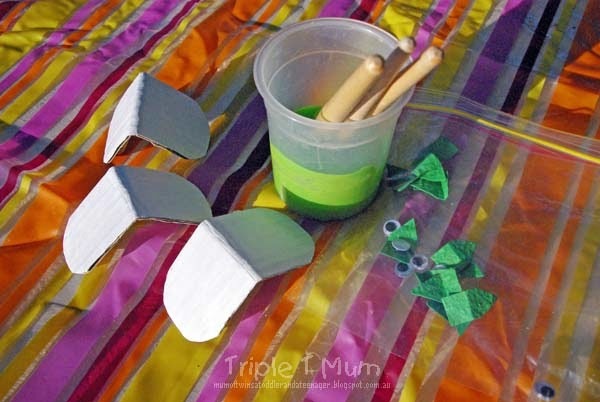 Ahhh - just the kind of inspiration I need for my craft-loving dinosaur crazy 3 year old! thank-you!! I've just added this to my todo's list... only that I cannot wait to give these dinosaurs a try. Thank you!!! !